Pump Protection Y Type Strainer. 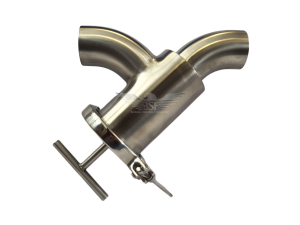 The pump protection (Y-Type) strainer is designed specifically to remove potentially damaging debris before it passes through the pump, However, It is now widely used as a strainer for coarse particles entering product lines. The pump protection strainer is designed to fit into small, confined spaces, as well as for ease of cleaning and the changing of the element. Designed & Manufactured by Berkeley Stainless Fittings Ltd, to the highest quality. Manufactured entirely from 316L Stainless Steel. 1″ OD – 6″ OD line size available. Standard finish: 240 grit O.D, Mill finish I.D – Other finishes available on request. For 1″, 1.5″ & 2.5″ line sizes, a concentric reducing cone will be used on a standard body. Alternative ends can be welded to customers requirements – RJT, IDF, CLAMP, DIN & SMS. Shut off valves can be welded to the unit. A pump protection assembly consists of: 1 x Element, 1 x Body, 1 x Single Hinged Clamp & 1 x Lipped EPDM joint ring. We recommend ordering a replacement element to ease cleaning and to minimize line down time. Jacketed & Duplex strainers can also be supplied to the customers specifications. Should you require anymore information regarding our strainers – Please contact your local branch and a member of sales will be happy to assist you.